I find it hilarious to type that because it was only a few years ago that I distinctly recall wretching at the taste of the various low-sugar/low-fat yogurts I tried to choke down in a vain attempt to get some protein. To me, most of it tasted like chalky, artificially-flavored goop. I decided that yogurt just wasn’t for me and it never would be. Then I started using it in baking. 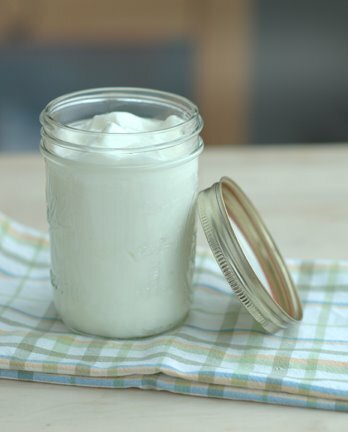 As you’ve probably noticed if you read this blog regularly, I use Greek-style plain yogurt as a replacement for oil or buttermilk in a lot of my recipes. At the outset, it was just to add some protein, but along the way I found that it brought a softness to the texture of muffins/quick breads that applesauce or other fruit puree didn’t seem to copy. It was a win-win situation in my head: the benefit of yogurt without the taste! One day at the farmer’s market, the vendor I regularly bought ricotta cheese from was selling tubs of fresh, homemade Greek-style yogurt. “Alright,” I thought, “maybe I’ll like fresh yogurt. After all, I can flavor it myself and peaches are in season.” At worst, it would end up in my latest loaf of strawberry bread. Not a bad fate. But that yogurt was destined for greater things. One spoonful and I was hooked. I started eating it nearly every day with a touch of raw honey and whatever fruit I could find. Peach-cinnamon, strawberry-apple, blueberry-banana…the possibilities were endless. It was so rich and creamy I found it hard to believe that it was fat free, but the vendor swore up and down that it was. Soon, every week I came home from the market with at least 2 tubs of it that might last the week (if I was lucky). Then came winter. And we were pummeled with snow. I couldn’t get to the market as often and missed my yogurt. In vain, I searched for a store brand that didn’t taste goat-cheesy (not my thing), runny (gross), or somehow…off. (I get it, I’m picky about yogurt. Sue me.) I even tried the more expensive, organic “all-natural” flavored ones and they were tasty, but had enough sugar to make me remember why I’d scratched them off the list years ago. I also began to consider just how much money I was spending on that particular dairy product (oh dear). The label read only: skim milk, non-fat dry milk, live active cultures. Could it really be so hard to just make it myself? -2 quart-sized mason jars with lids and rings. Plastic containers are also fine, but make sure you sterilize whatever you use. I do this by putting the jars in my dishwasher on a heated dry cycle. Leaving them in a pot of boiling water for 5-10 minutes works too. -1 candy/fry/probe thermometer that you can leave in said saucepan. -A warm place for incubating. I created a small incubator by placing a heating pad set to “low” on the bottom of an insulated cooler and placed the jars of yogurt on top of that. A crockpot set to “keep warm” works well, as does simply wrapping up the containers in thick bath towels and setting them in a warm place in your house. -Half-gallon of the milk of your choice. It can be pasteurized, but avoid ultra-pasteurized varieties as it is more difficult to cultivate the necessary bacteria in these. I used skim milk, but any fat content will do. -1/2 cup of plain yogurt containing live active cultures OR a powdered yogurt starter (which can be found on Amazon.com). I used a small container of store brand plain, non-fat yogurt. -1/2 cup of non-fat dry milk to aid in thickening. For thicker, Greek-style yogurt, you will also need a colander lined with several layers of coffee filters or cheesecloth set over a large bowl. -Begin by placing the half gallon of milk in a heavy-bottomed saucepan and putting the pan over medium heat. Clip the candy or fry thermometer to the saucepan and allow the milk to heat to 185 degrees F.
-Once the milk cools to 110 degrees F, add the 1/2 cup yogurt and 1/2 cup dry milk and whisk until smooth. Ladle this mixture into the jars or containers and secure lids and rings. -Incubate the yogurt in a warm place for 7-8 hours. At this point, it will have thickened and some liquid (whey) will probably have settled on the surface. At this point, you may CHOOSE YOUR DESTINY! You can either move the jars directly from incubation to the refrigerator. After several hours of cooling (overnight is best), you will have delicious yogurt that can then be flavored with any number of things. Fruit puree, jam, raw honey, cocoa powder/raw honey, agave, cinnamon, and even herbs are all great. Or if you’re like me and love the thick, rich flavor of Greek-style yogurt, pour the just-incubated yogurt into a colander lined with several layers of coffee filters or cheesecloth set over a large bowl. Set that in the refrigerator and allow it to strain for several hours. You will be left with a colander full of thick, wonderful, protein-rich yogurt and a bowl full of whey (which you can discard or use in other recipes). Ladle the yogurt back into the jars and store in the refrigerator. -Mix 6oz. yogurt with 1 tbsp. all-fruit strawberry preserves and a drop of vanilla extract for strawberry creamsicle yogurt. -Mix 6 oz. yogurt with 1/2 tbsp. raw buckwheat or apple blossom honey and a shake of cinnamon. This goes great on top of diced apples or peaches. -Mix 2-3 tbsp. yogurt with a can of tuna, some Dijon mustard, and assorted vegetables for a high-protein tuna salad. -Mix 4oz. yogurt with one small cucumber, pinch of thyme, and cayenne pepper and use it as a spread on sandwiches or as a vegetable dip. -Mix 4oz. yogurt with 1 head of steamed, diced cauliflower, a dash of cayenne pepper, onion powder, garlic powder, and a handful of parmesan cheese. -Blend 4oz. yogurt with 4oz. light cream cheese, a can of drained artichoke hearts, a few tbsp. of parmesan cheese, herbs, dry mustard, and some sautéed leafy greens and garlic for a fantastic dip. So you see, yogurt has a multitude of sweet and savory uses. Usually, if a recipe calls for sour cream or mayonnaise, I like to see if part or all of that can be replaced with yogurt. It adds a significant amount of protein and is also a great source of calcium. There you have it: Yogurt 101. Go to it!